With over 10,000 reserved shed seats and room for nearly 18,000 more on its expansive sloped lawn, First Midwest Bank Amphitheatre, located just south of Chicago in Tinley Park, is the Midwest’s largest outdoor concert space.Owned and operated by Live Nation, the venue recently hired Clearwing Productions of Milwaukee to design and install a full lawn delay system, which now is comprised of 42 L-Acoustics KARA enclosures. With all acts coming through the venue carrying their own FOH production, Live Nation required a new delay system for its sizable lawn audience that would meet or beat the audio quality experienced by those under the shed. Using L-Acoustics’ SOUNDVISION acoustical modeling software, Clearwing’s Bryan Baumgardner designed a complementary delay system featuring four arrays of KARA: two main LR arrays each comprised of 12 cabinets, and two outer arrays of nine enclosures. Under the guidance of Clearwing’s Kevin Gillson, the arrays were flown under the back lip of the shed roof and are powered by a total of eight LA8 amplified controllers. 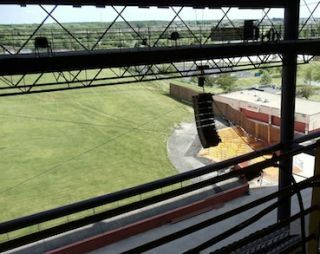 According to Live Nation central region production director Chris Weathers, Clearwing won the project bid both on its reputation for service and the comprehensive SOUNDVISION models that Baumgardner provided. “Clearwing came out earlier this year, took a bunch of photos and measurements of the venue, imported those details into the computer, and then gave us several potential system designs to choose from,” he said. “The visual models spoke a thousand words in terms of exactly what coverage and level we would achieve with each system, and how we would minimize the noise pollution into the community just beyond our perimeter. It made it extremely easy to show management how an L-Acoustics system would overcome the obstacles and challenges that our previous system had failed to adequately address. “With nearly two-thirds of our audience seated on the lawn during sold-out performances, the majority of our customers are now hearing shows on the new delay system, which is an obvious improvement,” he added. “In the grand scheme of things, I really think that our purchase of KARA and LA8 will equate to much higher customer satisfaction and, ultimately, better ticket sales, so it’s a great return on investment.”Hosting an extremely wide variety of musical artists – from country, pop and rock to hip-hop, alternative and metal – First Midwest Bank Amphitheatre annually welcomes more than 400,000 music fans each year.